What Is RunSmart @ RunTex? The benefit of group training sessions at RunTex, but with a program specifically designed for YOUR goals, not a mass-produced program. RunSmart is designed for anyone wanting to become a better runner and to prevent injury - regardless of skill, mileage, or running pace. Have a specific fitness goal or training for an event? Build a program to fit your schedule. Just wanting to run for fitness? Build in some structure and prevent injury in the process. Your program is as long as you want and is based on a $40/month program fee (initial month $55). 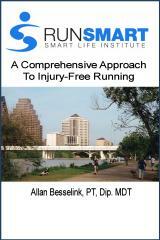 Your program is based on the book “RunSmart: A Comprehensive Approach To Injury-Free Running” by Allan Besselink, Austin physical therapist and endurance sports coach. All programs will be developed by the author himself on a biweekly basis, and a copy of the book is included in your registration. Program participants will receive discounts for a number of services to foster your development as a runner. Can't attend the information session? Registration is currnetly via phone and email only. This program is on-going and on a month-to-month basis.